$49,000.00 Order of Nakhimov, 2nd cl., #162, bestowed in August 1945 upon a submarine officer of the Black Sea Fleet as retroactive award for his submarine service in 1941-42. At that time, the recipient was deputy political commander of the 1st Sevastopol Submarine Brigade, Black Sea Fleet, and took part in sinking of two enemy vessels (one of which was the infamous Romanian ship Struma carrying Jewish refugees.) He also distinguished himself while serving in the same capacity in the defense of Sevastopol and Novorossiysk. With just 471 ever bestowed, the Order of Nakhimov 2nd cl. is one of the hardest to find Soviet awards - and also one of the most beautiful. Only 28 of them were issued to submariners. This extraordinary piece is in very fine condition. Comes with a copy of the award recommendation and wartime service record. $9,500.00 Order of Suvorov, 3rd cl., Type 1 Var. 1, #571, awarded in September 1944 to an infantry battalion commander of the Northwestern Front. In July 1944, his battalion on a single day withstood 20 German counterattacks supported by tanks and aviation, and then in its turn attacked dislodging the numerically superior enemy. The recipient was a true war hero who served as a frontline infantry officer throughout the entire war, was wounded in action four times, and received five combat decorations. The order has been reconverted (i.e. converted to screw back in compliance with post-1943 regulations and later restored to its original appearance.) Although the suspension and eyelet are not original, this is still a genuine Type 1 piece, very rare even in restored condition. Comes with archival research and English translation. $14,600.00 Documented Group of Two: Order of Suvorov 3rd cl. #3143 and Order of Kutuzov 3rd cl. #7717 (rare version with serial number and mint mark at 6 o'clock), with the order booklet. Awarded to a rifle battalion commander. He was the first to cross the Bug River (marking the Soviet western frontier) in August 1944, and led an assault that carried three fortified German lines during the January 1945 offensive in Poland. For the former feat, he was recommended for the Title of Hero of the Soviet Union, but received "just" the Kutuzov 3rd cl. Both awards are in excellent condition. The group includes comprehensive archival research and English translation. $6,700.00 Order of Suvorov, 3rd class, Type 3, #8254, awarded in December 1943 to commander of a tank support motorized infantry battalion. In October 1943, he in the lead of his troops stormed the Turkish Wall (Perekop Isthmus) in Crimea and was the first to break into the enemy position. He thus established a strategic bridgehead that would be later used for the liberation of Crimea and successfully defended his position against numerous enemy counterattacks. He was recommended for the Title of Hero of the Soviet Union and although the award was approved by almost the entire chain of command, it was downgraded to Order of Suvorov 3rd cl. by the 4th Ukrainian Front. This is one of only awards of this level that are a downgrade from the proposed Hero Star! The order is in outstanding condition, far better than the average. Comes with archival research. $2,300.00 Order of Alexander Nevsky, Type 1 Var. 3 suspension converted to screw back by its recipient to comply with the post-1943 regulations, #12836. Awarded in August 1944 to a courageous artillery officer for destroying German tanks, artillery pieces and infantry, and repelling 8 counter-attacks near Lvov. In good overall condition, an attractive example despite partially restored enamel. Comes with complete archival research. $3,200.00 Order of Alexander Nevsky, Type 2 (riveted construction), #9822, awarded in August 1944 to a tank battalion commander. He and his battalion inflicted heavy losses on the enemy and made a decisive contribution to the capture of the city of Polotsk in Belorussia during the Soviet Bagration offensive. In addition to the Order of Alexander Nevsky, this heroic tanker also earned Order of Suvorov 3rd cl. (#2947), three Orders of the Red Banner and a number of other decorations. The Nevsky is an extremely attractive piece in very fine to excellent condition - among the best Type 2 Nevskys we have seen. Comes with archival research. $2,700.00 Complete Documented Group of 3 Awards: Order of Alexander Nevsky, Medal for Valor and Medal for Victory over Germany. The Nevsky is an extremely scarce version with serial number 12229 engraved at 5 o'clock. All three decorations are in near mint condition; the Nevsky in particular is literally impossible to upgrade condition-wise. The recipient, an Infantry platoon commander, had been wounded in combat four times and incapacitated by the end of the war. Comes with archival research and translation. $4,750.00 Documented Group of 5 Decorations to deputy commander of a "Guards Mortars" Regiment (Katyusha Rocket Launchers.) 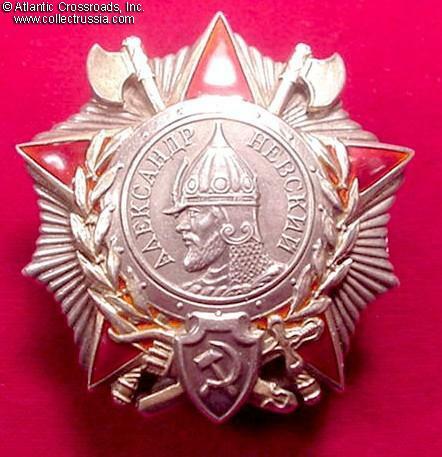 Includes Order of the Red Star #29834; Order of Alexander Nevsky; two Orders of the Patriotic War 1st cl. (both WW2 issue); and an Order of the Red Banner. The Red Star was awarded very early on for the defensive phase of the Battle of Moscow, specifically for the defense of Tula - the famous arms manufacturing center near Moscow that never surrendered despite many German attempts to capture it. Condition of the decorations ranges from very fine to excellent. This highly uncommon group includes order booklet and archival research. $1,975.00 Order of Alexander Nevsky, Type 3, "Deep Dish" version, #30751, awarded in April 1945 to an Azeri national, a commander of a tank-borne Guards rifle company with the 6th Guards Tank Army. Riding on top of American-made Sherman tanks, he and his men stormed several villages in western Hungary during the offensive to Vienna and inflicted severe losses on the SS troops that confronted them. The badge is a beautiful and uncommon piece featuring deep counter-relief of the star and distinctive "shadow" of the starburst on the reverse. It is in excellent condition and includes original silver screw plate. Comes with a very interesting award commendation that specifically mentions fighting against SS troops. $1,100.00 Order for Service to the Homeland in the Soviet Armed Forces, 3rd cl., #80445, awarded in May 1987 to a navigator of an AN- 12 transport airplane for exemplary service in Afghanistan. He took part in combat operations in many areas including Khost, Herat, Kunduz and Kandahar. On at least one occasion, he saved his crew and machine by detecting a rocket fired at his airplane upon takeoff and directing the evasive countermeasures. The order is in near mint condition. Comes with a photocopy of the award record card and award recommendation. $345.00 Order for Service to the Homeland in the Soviet Armed Forces, 3rd class, #137730. In very fine to excellent condition.